In 1980, feeling very dissatisfied with his job at the time, Frank Siklich resigned and decided to embark on a trip to the United States for a much-needed holiday. Whilst walking the streets of San Francisco, Frank happened upon a poster gallery in Union Street. The fine art prints on display struck a chord with him, and an idea began to formulate in his mind — something new that he could bring home to Adelaide. In March of 1981, The Poster Gallery opened its doors in Grote Street as the first dedicated, fine art poster shop in Australia. As exciting as this new business was, it soon became apparent that the mainstay of the business was to be custom picture framing, so Frank began attending framing classes and trade shows in order to learn the craft. From its early beginnings with the simple notion of helping those with a taste for art to decorate their homes at a reasonable price — without having to rely on the tired, typical reproduction prints that had been around for decades and were available everywhere — the business grew and by 1984 a second outlet, Prints Etc, had opened in City Cross. 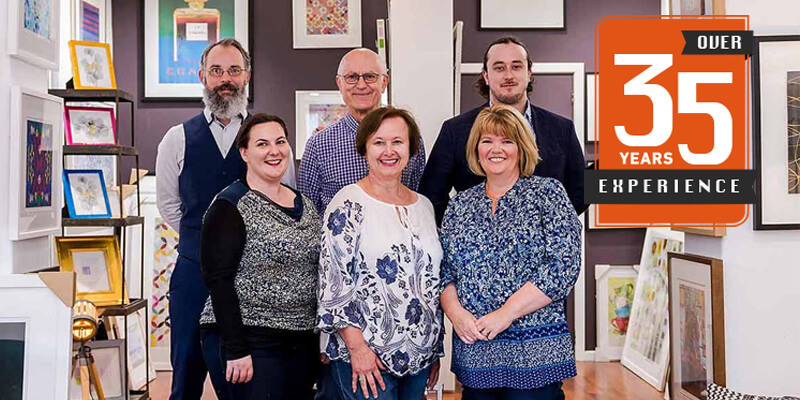 The business is now known as Art & Frame and is located at 273 Unley Road, Malvern, where it has been since 1992. Not only does it cater for all budgets with its custom framing, but it also retails a large selection of mirrors and produces its own fine art prints. In the showroom you will find original pieces, limited edition prints and open edition prints available on both canvas and fine art paper. Today, Art & Frame’s underlying ethos remains the same as it was in the early days, which is to satisfy people’s desire to fill empty walls with pieces of their own that the shop has beautifully framed for them, or with unique art from Art & Frame’s own collection. The friendly staff know that choosing just the right frame or piece of art can be time-consuming, so they always give people as much time as they need to come to a decision. To this day, the staff regularly attend interstate and international art and framing trade shows in order to keep themselves and, therefore, their customers attuned to the latest possibilities in framing and the most recent trends in interior design and decorating with regard to wall décor.